In 1968 His Divine Grace A. C. Bhaktivedanta Swami Prabhupada published the Bhagavad-gita As It Is, which has since sold tens of millions of copies in dozens of languages. As a lifetime devotee of Krishna and a consummate Sanskritist, Srila Prabhupada spells out the clear conclusions of the Gita that are often obscured by arms-length commentators with their own agenda. 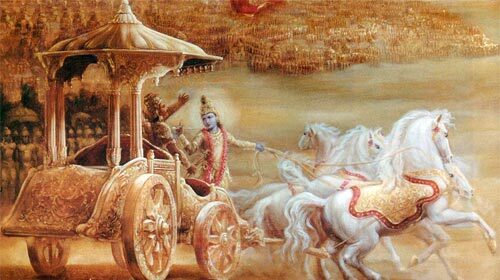 Srila Prabhupada's purports (commentaries) illuminate for us the verses spoken by Krishna and Arjuna. The following condensed version of their historic conversation combines key points from the verses and purports in the same sequence as the original. These are not direct quotes and thus cannot replace the complete Bhagavad-gita As It Is. Instead, this version provides an overview of the philosophical thread of the Gita. It is consistent with Srila Prabhupada's comprehensive edition and can be used for introduction or review.